On Tuesday, U.S. President Donald Trump is scheduled to give his second State of the Union speech, addressing a new class of Congress that has a record number of minorities and women. Sitting behind Trump during the speech will be Speaker of the House Nancy Pelosi, who kept House Democrats unified against the president in a brutal fight over wall funding that triggered the longest partial government shutdown in the country's history. The speech will be given a week later than the originally scheduled date of Jan. 29, after Pelosi blocked Trump from delivering his address until the government reopened. The theme of this year's address, according to a White House senior administration official, is "Choosing Greatness." According to the official, the president will lay out his position on immigration and border security, on protecting American workers with trade deals with China and replacing NAFTA, lowering the cost of health care and prescription drugs, as well as diplomatic and military efforts around the world to stop "endless foreign wars." The official said the president will deliver a "unifying, bipartisan, optimistic tone." But experts are skeptical, and predict Trump's goal will be to project strength to his base. "We can still expect him to have some of that campaign tone," said Vanessa Beasley, a presidential rhetoric expert at Vanderbilt University. Trump does not appear to be cultivating a pacifying atmosphere ahead of the speech, blasting his opposition on Twitter about border security. "Dems do nothing. If there is no Wall, there is no Security. Human Trafficking, Drugs and Criminals of all dimensions - KEEP OUT!" he said. On Sunday the president again hinted at a second partial government shutdown or declaring a national emergency to bypass Congress for wall funding. The House Democratic Women's Working Group invited female lawmakers of both parties to wear white at this year's State of the Union to mark the suffragette movement, which led to a woman's right to vote in 1920. At Trump's first joint address to Congress in 2017, Democratic women wore white amid concerns that the new administration would suppress women's rights. This year, the message is different. With a record number of women elected to Congress, particularly House Democrats, Congresswoman Lois Frankel, chair of the Women's Working Group, said wearing white sends a positive message that "a big part of our agenda is going to be promoting the economic security of women and their families." They include equal pay, affordable child care, family-friendly workplaces and leave policies. It also includes combating sexual harassment. Trump may not receive the message positively. "He feels threatened and a little bit embarrassed," said David Barker, professor of government and director of the Center for Congressional and Presidential Studies at American University. "To him, all the women sitting out there wearing white is just a big statement of opposition." Last year, many Republican women wore red, white and blue as a show of support for the military. They have not announced a dress code this year. Many female Democrats wore black to support the #MeToo protest against sexual harassment and assault. 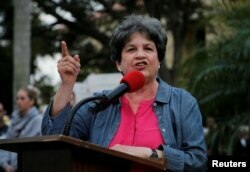 FILE - U.S. Rep. Lois Frankel (D-FL) speaks at a rally in Delray Beach, Florida, Feb. 19, 2018. Several more women will play a role in the political theater that will unfold late Tuesday in the U.S. Capitol. They will be sitting on the Democrats' side of the aisle. Victorina Morales, an undocumented Guatemalan and former housekeeper at a Trump golf club in Bedminster, N.J., will attend as a guest of New Jersey Rep. Bonnie Watson Coleman. 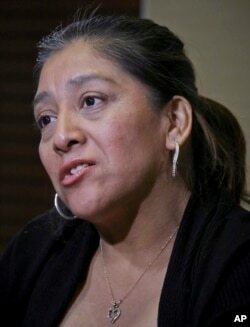 Morales was fired after revealing her status in an interview with the New York Times, and currently faces deportation. Ana Maria Archila, an activist who confronted then-Republican Sen. Jeff Flake during the confirmation process for Supreme Court Justice Brett Kavanaugh, will be attending as a guest of New York Congresswoman Alexandria Ocasio-Cortez. Archila, along with fellow protester Maria Gallagher, confronted Flake in an elevator with their personal stories of sexual assault. Shortly after the viral exchange, the senator called for another FBI investigation on sexual assault allegations against Kavanaugh as a condition for his vote. 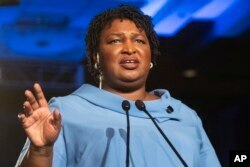 Stacey Abrams, an African American who garnered national attention in her unsuccessful bid to become governor of Georgia, will deliver the Democratic response — a signal of her party's focus on diversity. "Democrats are trying to project that they are a party of young people, people of color and women," American University's Barker said. "While Republicans is the party of all white men." FILE - Then-Georgia Democratic gubernatorial candidate Stacey Abrams addresses supporters during an election night watch party in Atlanta, Nov. 6, 2018. Abrams also signifies her party's concerns of a fair election system, Vanderbilt's Beasley said. "Were all the votes counted in Georgia?" she asked. "Do we have a system that makes the Voting Rights Act come to life, or do we have a system in which voters are suppressed in particular regions?"